Tired of dying to mini-sentries on Helltower? Tired of not getting an epic spell from the Witching Hour because you didn’t survive the run up the incredibly-lethal disappearing bridge? Tired of finding yourself with absolutely no options while pyros, skeletons, and monoculi bear down on you? Well, too bad. It’s all gonna keep happening. But you can have it happen to you significantly less by switching to Demoman! Everyone’s favorite (or least favorite) explosive-slinging cyclops has a whirlwind of options at his disposal on Helltower. The map is so constrained that he almost always has something to do, and the health pack distribution is diverse and three-dimensional, a great environment for sticky jumpers. Almost any loadout involving explosives works, so pick your favorite non-shield secondary and get cracking. 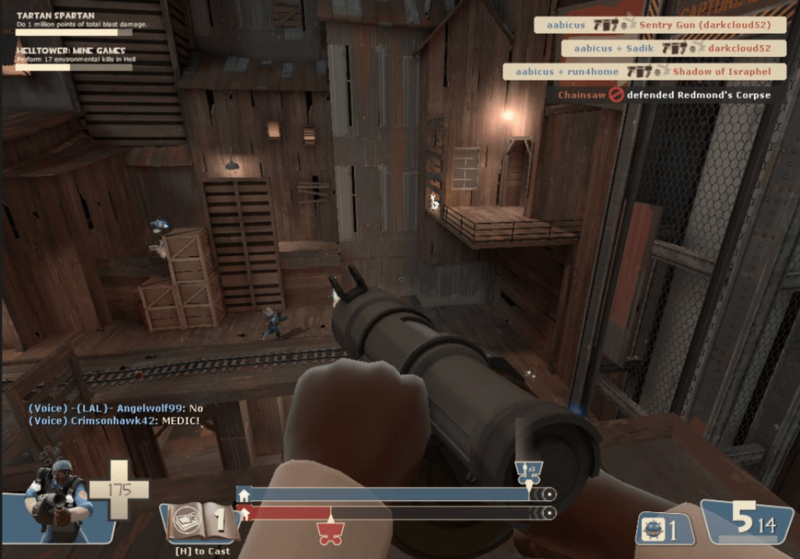 Just like in regular hightower, the titular tower is the highest point in the map, and you want to control it. You can rain pipes on a huge portion on the map, you’ve got a healthkit right there, and you can lay sticky traps that block the two most popular spawn exits. 2. Never fall off the Witching Hour bridge again. That bridge is a killer. Everybody goes there at the same time, and its a tapered dropoff to a bottomless pit on all sides. How about instead of running across it, you sticky jump from literally anywhere on the map with 1-2 stickies? 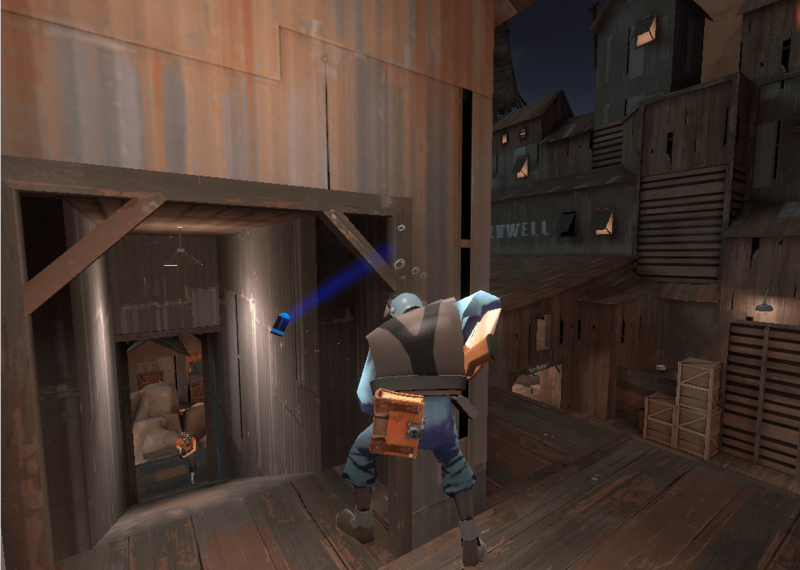 Through Merasmus’ door, you’re back at spawn with overheal and an epic spell. Just in general, make use of your sticky jumping ability! Valve added the ability to get to some previously impassable places like the roofs of the hightower and the shack facing Merasmus’ house, so always make sure to use your excellent mobility to take advantage of these. In general, the higher ground is better for you in almost any skirmish, but always adapt to changing situations and be willing to just abandon a fight if it goes south. There are more then enough health kits everywhere. -As soon as you stop Thrillering, use a single sticky to jump to the Epic spell on the platform of the hellish hightower. If you have a damage-dealing spell, shoot it at the enemy side of the platform, in case mobile enemies are trying the same thing. Carpet the platform and ramp with stickies and prevent anyone else from getting up there, then farm Epic spells so you can spit out Monoculi and skeletons. -Hide at spawn while most of the server population gets itself killed. Wait until the lightning gate has opened, then just sticky jump to the Bombinomicon. DM the surviving enemies and try your luck at grabbing the book. If you spawn with healing spells, I’d cast them quickly to regain all that health from the jump. A reminder that this is Hell, basically arena mode on amphetamines. Anything you do is incredibly risky, and won’t work often. But these are the two tactics that net me the most wins. My personal strategy with spells is to treat all non-damaging spells as free heals (did you know most of those heal a bit when you use them?) and save damage spells for when your weapons need reloading. The mobility spells don’t help you much when you can sticky jump, and your weapons deal more than enough damage already. The major exception to this rule is the Invisibility spell; save that spell and use it to clear out the sentries at that darn ramp where the cart progression always grinds to a stop. This spy is a demoman. Otherwise, spells aren’t a huge part of my arsenal. To be honest, spells just turn every class into the demoman for a few shots. Grenade Launcher/Sticky Launcher/Pain Train is a great all-around loadout for this map. You can push, you can defend, you can attack. Occasionally, I switch out the Pain Train for the Persian Persuader if I need survivability, because once you’re low on ammo it’s child’s play to jump back to spawn and tag the resupply locker. The Sticky Jumper can be good for sniper picks if they’re huddled up on that platform near the elevators, fly over there and Caber/Persuader them. 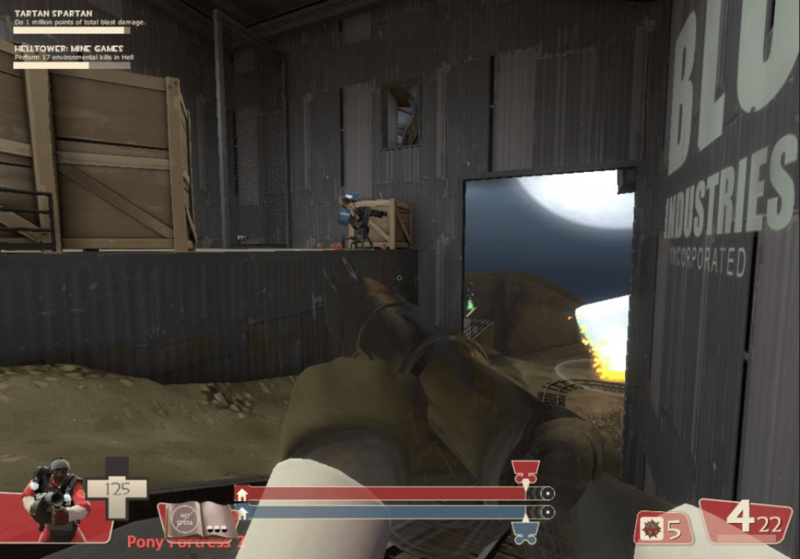 You can defend the exits at close range for a pretty long time as a persuader/Grenade Launcher demoman, since you replenish health with every kill and from that small ammo kit in the corner. Note that the Sticky Jumper doubles the ammo return from the Persian Persuader. I haven’t found the shields to be as useful, it really limits your mobility on such a three-dimensional map. Sentries also become your bane instead of your breakfast. So there you have it. Go be versatile! Demoman is a great class regardless of game mode, and nothing’s changed here. Be everywhere, and blow up everything. I’ve been using these exact strategies for the beginning of each round and in Hell. Played for 4 rounds and ended up dominating 5 players, as well as getting a 6k with some stickies on the cart.Very fun, I love demo on Hightower! It’s great to hear that from the man who runs the Demoman Advice Thread on SPUF!